With so many things to see and do in Thailand, many visitors to this beautiful South-East Asian country plan to travel around, taking in the cities, the temples, the beaches, and the scenery. But, Thailand is a large country so what’s the best way to get from A to B to C? Well, it may surprise you to hear that the most popular way to get around Thailand is to travel by bus. Long distance bus travel in Thailand is affordable, and because the bus network is so extensive, you can get practically anywhere in the country by taking the bus. Our guide to traveling by bus in Thailand will share the ins and outs of getting around by bus, whether you choose the public or private services, or opt for the more expensive and comfortable VIP options. Is Taking the Bus in Thailand Safe? Let’s be honest, traveling by bus in some Asian countries can be a little scary if you get a maniac bus driver who hurtles along narrow and bumpy roads. Luckily in Thailand, bus travel has a very good reputation. Local public bus services tend to use buses that are a little older and less comfortable, which makes these undesirable for anything but a short journey. However, the private companies operate newer buses that are in very good condition and are well maintained, making them safe for covering longer distances. 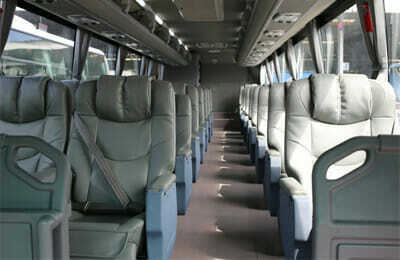 Seats are comfortable, the buses have air conditioning, and many have a washroom on board too. The bus drivers generally drive at speeds erring on the side of caution, averaging around 60 to 70 km/h, depending on the type of road and the conditions. There are quite a few different options for buying your Thailand bus tickets. The most obvious place to buy tickets is at the bus station itself, or you can use a travel agent within the city you’re staying in, or opt for an online tour operator such as 12Go. While it may be easy enough to buy your ticket at the bus station, it can be a bit daunting if you’re a first-time bus traveler and aren’t sure what exactly you’re buying. 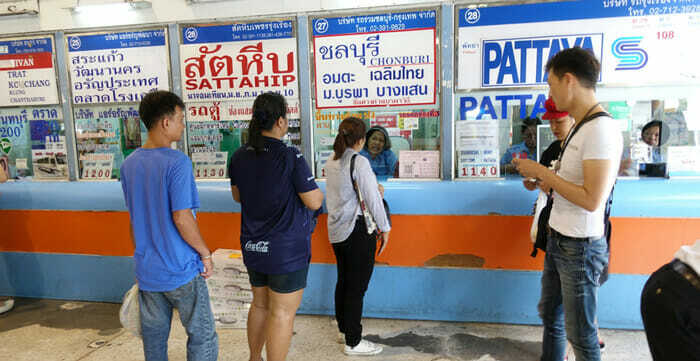 Travel agents can take this fear away, however, you’re likely to pay more for your bus ticket this way because the agent will take a commission on the ticket price, plus there are some unscrupulous travel agents operating in places like Khao San Road in Bangkok, so you need to be aware of this. For the above reason we would definitely recommend using an online tour operator, and 12Go has a very good reputation. Buying online is easier because you can see all of the options in front of you, read reviews from previous travelers, and make an informed decision before you go ahead and book, plus you have the backing of a larger company should you have any problems and need to make changes. As mentioned above, there are two types of bus operators within Thailand: the public buses and the private buses. Public buses, as you probably know, are operated by local authorities and are designed to be affordable for everyone. You’re more likely to use these buses if traveling within a city, on shorter journeys, but there are some public bus services that operate between cities, on the most popular routes. 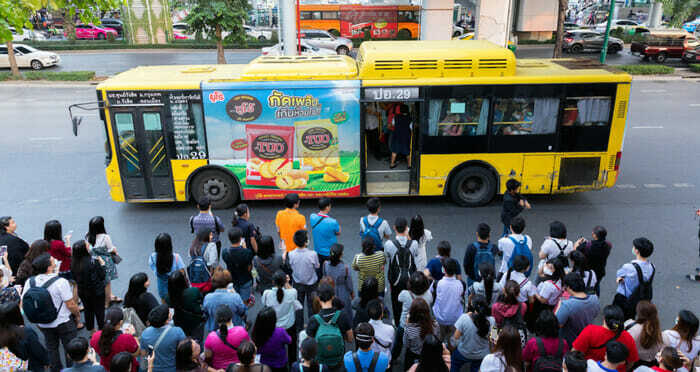 Because these buses tend to be older, less comfortable, and perhaps not as well maintained, we would not recommend using public buses in Thailand for city to city trips, but they are great for those short local trips! The private bus companies are a great choice for those longer distance trips. Generally in Thailand there are two classes of private bus: Express and VIP. 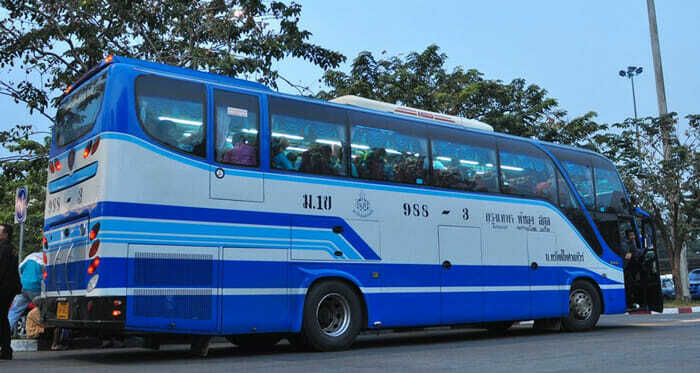 Although they’re called ‘Express’ buses, these may not be the fastest way to get from city to city – yes, they are much faster than the local buses but Express buses in Thailand can and do stop numerous times along the way, calling at other bus stations and even just picking passengers up from the side of the road. Although this makes the journey longer, this can be a great advantage if you find yourself somewhere outside of a town, or you didn’t have time to buy a ticket in advance. Hop on to the Express bus and you can buy your ticket as you board it! So, what’s the comfort like on Express buses in Thailand? Quite good, actually. 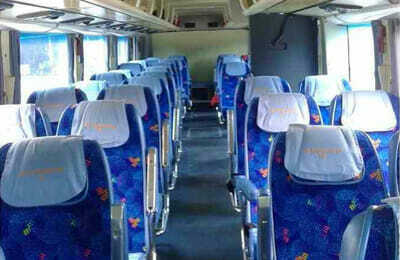 The seats are quite soft and can usually recline a bit, and there are often toilets onboard. Air conditioning is standard, plus, depending on the operator, you may get complimentary water and/or snacks. Buses will make stops along the way for you to get out and stretch your legs, buy food, and use other services. The downside is that there may be a little less leg and arm room on the Express buses, but they are very reasonably priced and frequently available, especially for popular city to city routes. Just bear in mind that these are also an extremely popular way for locals to travel too so the buses are usually quite full, and they get booked up in advance especially during holidays and festivals. Book your tickets early using 12Go to make sure you get what you want. Despite the name, VIP buses in Thailand are not only for use by Very Important People! However, the acronym does represent a higher level of comfort and luxury than you will find on other buses. Traveling on a VIP bus in Thailand is considered to be safe, fast, comfortable, and (all things considered) affordable too. Yes, the VIP buses are the most expensive type of bus travel in Thailand, but compared to transport in Western countries, they are still incredibly good value for money. On the comfort side of things, VIP buses usually have just three seats per row, organized as two on one side of the aisle, and one on the other. Because of this you get larger seats that allow for more elbow space, and there’s a bit more leg space in these buses too as there’s a couple of rows less than on Express buses. The seats are soft and recline quite a long way, so if you’re traveling overnight you have some chance of getting some sleep. 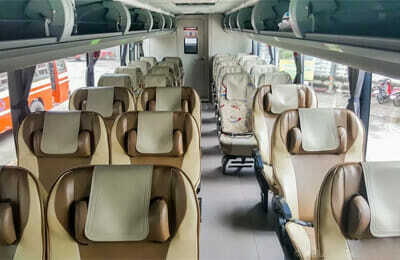 Thailand’s VIP buses generally provide water and snacks, and there will be toilets onboard. There will also be TVs, but these will be playing channels only in Thai. Ticket prices often include a meal voucher for when you stop at a service area, allowing you to get dinner, or you can buy your own food to take back onboard with you. There are a couple of minor drawbacks to traveling by VIP bus in Thailand. One is that although air conditioning is a necessity, it is usually turned up way too high and can get really cold – bring a jacket or a seater to compensate for this. Another is that they do not stop as often as Express buses – of course, this can also be an advantage, but if you’re someone who likes to move around and stretch your legs more frequently, the VIP bus might not be the best choice for you. On the plus side, fewer stops means you get to your destination quicker. It’s worth mentioning Green Bus here because this is a great bus company for anyone traveling around Northern Thailand, although they do have routes right across the country from east to west, and even as far south as Phuket. Their main hub is located in Chiang Mai though, and you’ll find the majority of their services are centered around that city, with Chiang Mai to Chiang Rai being their most popular route. There are almost twenty buses per day traveling along this route, making Green Bus an excellent option if you’re planning a trip from Chiang Mai. On the one hand, Green Bus operates new and very comfortable VIP buses that are even a cut above some of the other popular bus companies, so if you prefer to spend more to get real comfort, they’re great. Even so, there have been reports of older and less well-maintained buses being used on some routes (Express buses) and these will not have such high comfort levels. If you’re concerned as to whether the bus you get has services such as toilets and snacks onboard, be sure to book through 12Go as it’s always very clear what type of bus you are buying tickets for. In summary, traveling by bus in Thailand is an excellent way to see this amazing country. You will see far more from the window of a bus than you will from a plane, and buses are usually considerably cheaper than airplanes too. 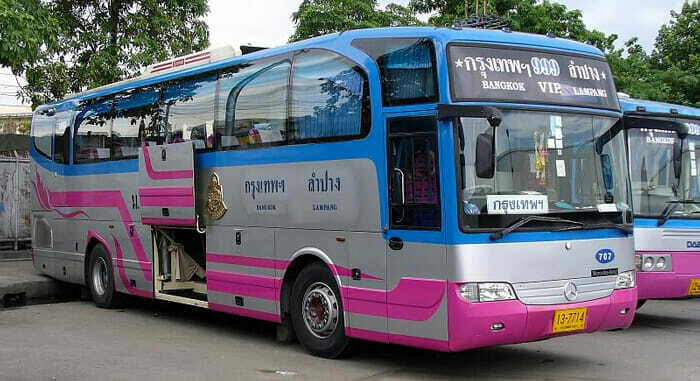 With great flexibility in the number of routes and destinations you can travel to, buses are by far the most convenient way to get from A to B in Thailand; they’re affordable, comfortable, and safe, with the only real drawback being the amount of time it can take to get from city to city.